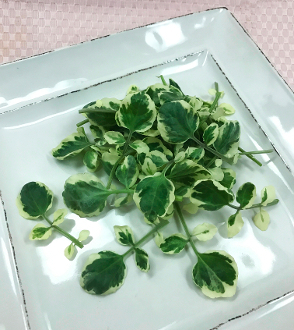 Brilliant white-edged green leaves. Their beautiful varigated color makes them a unique type of Watercress. Their fresh, peppery, nutty taste is the ideal enhancement to specialty salads & sandwiches. Float on a soup to create a beautiful presentation. Also a great flavor addition to shrimp, crab & ahi!